We’d love your help. Let us know what’s wrong with this preview of Living Jesus by Randy Harris. To ask other readers questions about Living Jesus, please sign up. I have heard Randy Harris speak several times. He is definitely one of the great Christian thinkers of our generation. This book's thesis is how Christians would behave if they truly tried to live by the Sermon on the Mount. Excellent book. Deep thoughts. It makes you think and, more importantly, it will challenge you to examine your life. I enjoyed this book, I did. Taking a look at the Sermon on the Mount is an idea I really like, and I love the emphasis on actually living out the teachings in this "sermon." How do these teachings apply to our life, how we are to live, how we are meant to treat others along the way? This book addresses just that. We are told on page 11 that "this book is not just a study of the Sermon on the Mount. It's a way of discovering what Jesus says so we can do what Jesus says." I enjoyed the chapter titled "You Are Blessed," where the author talks about how Jesus started his teaching with blessings, instead of starting with the commands, showing that we are blessed and loved without having to do something first to earn it. The way the author puts it is by saying (on page 32) "You're trying to make yourself loved rather than doing it out of response to the love that God's already given." "When you follow Jesus Christ it will never lead you to hurt or marginalize any group of people; when that happens, that's not just bad living - that's a result of bad doctrine. True teaching doesn't do that. It loves. It embraces. It transforms. It never humiliates. It never abuses. It never puts down." I loved so much of this book. It really was an interesting read, and I'm glad to have read it. I would recommend it to any Christian. We talk a lot about the “Sermon on the Mount,” but it’s not often we see people living it. This is why books like Living Jesus are important, helping us learn to put into practice some of the most difficult exhortations in the Bible. Randy Harris writes, “I’m not attempting to write a scholarly book on the Sermon on the Mount. I’m trying to provide a field manual for living the life Jesus wants for us” (12). Harris urges his readers to ignore the perspective of “Jesus raising the bar so high tha We talk a lot about the “Sermon on the Mount,” but it’s not often we see people living it. This is why books like Living Jesus are important, helping us learn to put into practice some of the most difficult exhortations in the Bible. Randy Harris writes, “I’m not attempting to write a scholarly book on the Sermon on the Mount. I’m trying to provide a field manual for living the life Jesus wants for us” (12). Harris urges his readers to ignore the perspective of “Jesus raising the bar so high that we can only try and fail and so learn a lesson about the grace of God,” stating, “This isn’t ‘Suggestions on the Mount’” (13). We are encouraged to take seriously the words of Christ and live them. “This is not only a life that should be lived. It’s a life that can be lived” (22). Harris breaks the text down into twelve sections, providing practical commentary on each passage, after which several discussion questions are provided for group study, as well as a few challenging examples for living each section. The book concludes with a description of the covenant Harris has made with a group of college students to take seriously the Sermon on the Mount, to memorize it, and hold one another accountable to living it daily. The “Monk Warriors” of Tau Chi Alpha (“Toughest Christians Alive”) may seem a bit gimmicky—we are talking about impressionable college students—but the journey they share is provided as an example of how to “live Jesus,” not the way. Further aid comes by way of suggested reading material and the DVD series by Harris upon which Living Jesus is based (not having seen the series myself, I cannot comment on its effectiveness, though I would recommend the book on its own). A unique intertwining of biblical study and practical application. I want to do my best to live out Jesus' teachings after every chapter and at the conclusion. I am a big Randy Harris fan. 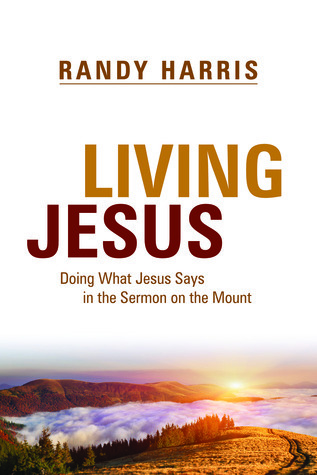 In this book he covers in 12 chapters Jesus most famous speech-the Sermon on the Mount. I have read the words many times but Randy made me look at it differently. He also encourages you to live out what Jesus was conveying to us. Hence the title of the book-Living Jesus. At the end of each chapter is a suggestion of how you can live out what is brought out in each chapter. My men's Bible study group covered it in six weeks. We used the DVD that goes along with the boo I am a big Randy Harris fan. In this book he covers in 12 chapters Jesus most famous speech-the Sermon on the Mount. I have read the words many times but Randy made me look at it differently. He also encourages you to live out what Jesus was conveying to us. Hence the title of the book-Living Jesus. At the end of each chapter is a suggestion of how you can live out what is brought out in each chapter. I am leading a Bible study on the Sermon on the Mount, using the Life Guides curriculum. This book is a great supplement to that material. I appreciate that this book is thought-provoking and challenging while including additional questions, yet it does not feel really heavy or as if it's trying to be a commentary. This would be a great resource for someone who wants to do an independent study of the Sermon on the Mount or who needs supplemental material for leading a Bible study. I thought it was a good study on the sermon on the mount, I liked that he started at the end for the first chapter, pretty basic, but great for newer Christians. Randy is very sound in his belief and I look forward to reading more of his books. Loved his previous books, but this one was lacking. Judging - everyone does it? Please. That doesn't make it right. Weak. There IS good stuff in the book, but overall it's lacking a focus on love, which Jesus was all about. Very disappointed in this book, especially after reading his others. The author explains, "So I'm not attempting to write a scholastic book on the Sermon on the Mount. I'm trying to provide a field manual for living the life Jesus wants for us." Great little book. We used it as a small group discussion guide (with the DVD) for a small group meet up in my home. It helped with discussion and got us into the Sermon on the Mount in a productive way. Enjoyed reading the book and it was even better when I heard Randy present the book's summary live at Harding Lectureship 2013. Very good read, walks you through the Matthew and the Sermon on the Mount. Geared more toward's men, but applies to women just as easily. Encourages action and deeds over words. Great book. It looked at the overall principles of the Sermon on the Mount and gave very practical ideas for implementing it. Wonderful exposition on the Sermon on the Mount with a bent toward really living it out. Back to "sermon on the mount" basics. Good for new Christians in understanding the mind of God. A very simple, teachable and applicable review of the sermon on the mount. Randy understands the spirit of Christ's teaching well. It is not deep reading but is certainly worth reviewing. A great read. Don't miss the material at the back of the book. Provides some practical suggestions for living Jesus. Now the real challenge begins!